Sometimes called a power sluice, a highbanker is a very flexible piece of equipment when you're gold mining in areas with a good amount of water. This highbanker setup, which is made in the USA, includes everything you need. Sluice with Stand: 10" wide x 48" long x 3" high is made out of strong .080 gauge 5052 aircraft aluminum, which is light weight, plus aluminum makes it easier to use a magnet to remove the black sand build up. Aluminum riffle cage and box will stand up to many years of use! The unique elongated 45 degree z-riffles are great for trapping gold. In the bottom of the sluice is 12 inches of black matting for fast gold ID, followed by 36 inches of miner's carpet. Expanded metal riffles helps keeps the gold in the box and prevents the rocks from knocking it loose. Sluice stand has 18" high legs. 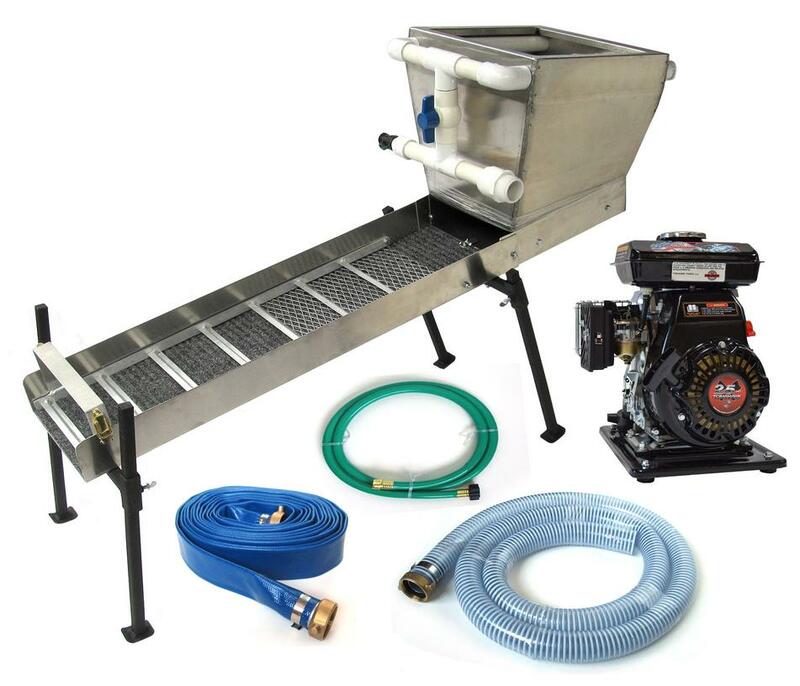 Hopper Dredge Box: Aluminum hopper box is 14" x 14" x 10" deep and has a 2" dredge inlet, a spray bar with built-in adjustable water flow and pressure port controls. Grizzly bars inside the hopper keep out big rocks and sticks and other debris. Hoses and Adapters: 6 feet of clean up hose with valve, 25 feet of 1.5" layflat house, 8 feet of intake hose. Also includes 1.5" female pin lugs, 1.5" x 1" bushing, 1.5" adapter, and 4 hose clamps. When ordered with the pump, this kit provides everything you need (except the gas) to get you out there prospecting! PUMP OUT OF STOCK! Also available with Tomahawk 2.5 hp water pump. Choose with or without pump in the drop down menu. Without pump $645.98. With pump $835.98. FREE SHIPPING in continental USA! This highbanker is shipped in two boxes. Approx. weights and dimensions: 17 lbs 20x20x18 (hopper) and 27 lbs 36x18x8 (sluice, hoses, etc.). Article on highbanking for gold.